When I went back to school to become a registered dietitian there were two paths I was interested in: private practice and working for a grocery store. Thus, I love today’s post by Utah-based Registered Dietitian Kayla Womeldorff! She works for Harmons and has some great tips for navigating the aisles. When I tell people that I work in a grocery store, they generally look confused. After a moment, they almost always ask me, “So what exactly do you DO as a dietitian in a grocery store?” And I understand the confusion. At first, it sounds like a pretty random place to have a healthcare professional. But really, what better place for an RD than where people are actually making decisions about what foods to buy? I am Kayla Womeldorff, one of four registered dietitians working for Harmons, a small, family owned grocery store chain with 16 stores in Utah. Before you get an image in your head of a strictly health foods or natural grocery store, let me tell you that while we do sell all the products you would usually find in those stores, we also carry conventional foods. You can buy your organic tofu right alongside your regular soda or bag of chips, if you so desire. We each have our own offices in our home stores where we are able to conduct individual nutrition counseling to both customers and employees. We counsel clients in many areas, including sports nutrition, weight loss/gain/maintenance, diabetes, heart disease, and general nutrition. This is one of my favorite parts of being a grocery store dietitian, and also probably the most helpful to customers: actually getting to show people foods on the shelf, and helping them incorporate foods they love into a healthy diet as well as showing them new products that maybe they hadn’t heard of or thought to try. We have store tours for specific health conditions, like diabetes and celiac disease/gluten free, as well as a general healthy living tour. We also provide tours and workshops for groups (like scout troops, for instance), as well as Lunch n’ Learns in the community and nutrition workshops in our stores for customers. Three of our stores also have cooking schools, and we team up with our chefs to teach healthy cooking classes. 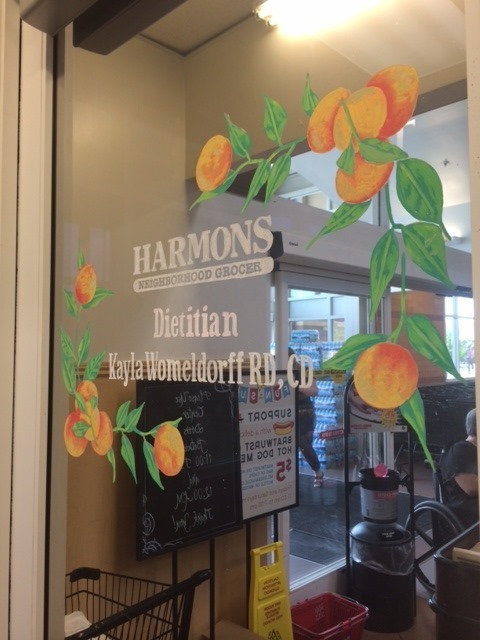 We have behind the scenes teams for our grocery, fresh meat, bakery, delicatessen and produce departments with a dietitian on each team to help make sure that Harmons is carrying the highest quality products for our customers. For example, our delicatessen does not use MSG, and our bakery has moved to using real cream and butter in our store made products rather than ingredients containing hydrogenated oils. 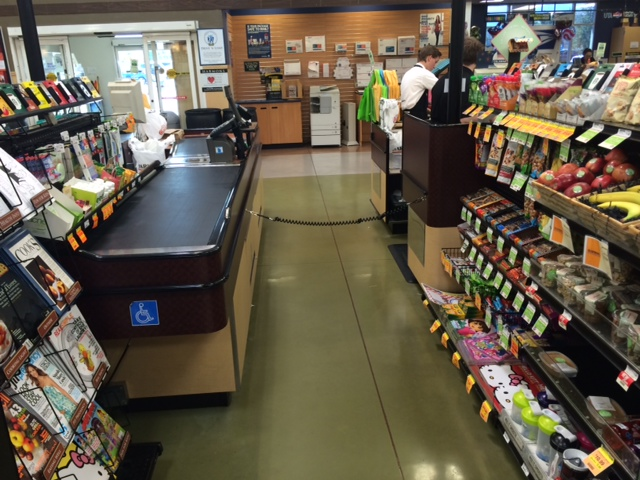 We also have Healthy Checkout lanes, which only include products that have been chosen by the dietitians. So, no candy, soda, chips, or magazines that don’t promote healthy lifestyles. I love that I’m not tempted to buy a buy a bag of chips right before I check out, and our customers with children are happy that they don’t have to battle with their kids over candy! In addition to helping customers, we also spend time educating our employees on nutrition. We have monthly nutrition themes and activities in the break room, and also have monthly presentations on the most current nutrition trends and research. 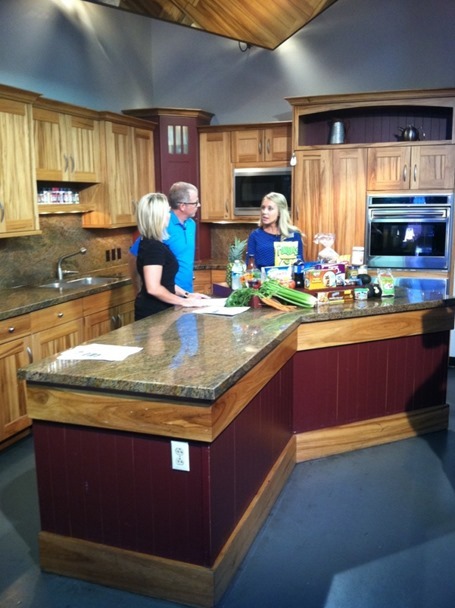 Marketing is another part of our job, and we work a lot with both print and television media. (Since January, I have been on the local news close to 30 times!) 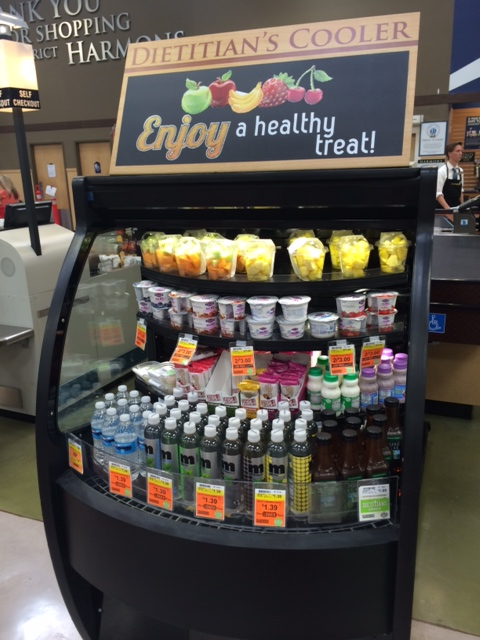 Harmons also has a blog that we write for weekly, where we talk about different foods that can be found in our stores, as well as current trends and general nutrition information. As you can see, we get to dabble a bit in a lot of different areas of nutrition, which keeps things fun and interesting. A big part of my job as a dietitian in a grocery store is helping people find healthful foods that fit in with their lifestyle, budget, and taste preferences. I’m a firm believer that what you eat the majority of the time is far more important than occasional treats, and so it’s important that those “most of the time” foods are actually good for you. – Fat content. Some are very high, with almost 10 grams of fat in a 6oz container. The jury is still out regarding the health benefits of full fat versus low fat dairy but, especially if you are watching your weight, limiting the fat in your yogurt can be helpful. I recommend either a 0% or 2% milk fat yogurt. – Added Sugar. Since yogurt is made from milk, it will have some naturally occurring sugar in the form of lactose. The best way to figure out how much sugar is added is to compare the sugar content of plain yogurt with a flavored yogurt of the same brand. Also, check to see whether fruit or sugar is listed first on the label. (This can be tricky as some yogurt companies cleverly disguise sugar on the label as “Evaporated cane juice”) The lower the better but ideally shoot for less than 20 grams of total sugar per 6oz serving of yogurt if fruit is listed before sugar on the ingredients list, or less than 15 grams if sugar is listed before fruit. – Has some (healthy) fat in it. I see a lot of people who assume that the fat free dressings are the healthiest. The problem with this is that your body needs fat to absorb the fat-soluble vitamins in your salad. Fat free dressings can also be packed full of sodium, sugar and fillers to account for the loss of taste from the fat. If you have a fat free dressing that you really love, make sure you are adding some nuts, a few slices of avocado, or a bit of cheese to your salad for a dose of fat to help absorb those vitamins. And if you are using an oil based dressing, be sure to keep your portion to around two tablespoons. – Is lower in sodium and sugar. Many people are shocked when I tell them that there are some “natural” salad dressings that have almost as much sugar as two Krispy Kreme donuts in a two tablespoon serving! I’ve also seen some “natural” salad dressings with close to 400 milligrams of sodium per serving. Top Picks: Dressings vary widely even within brands, so check the nutrition facts label for ones with less than 150 milligrams of sodium and less than 4 grams of sugar per 2 tablespoons. Or better yet, make your own if you have the time! Another product with a health halo, some of these are really just candy bars with different packaging and some added soy protein isolate. Many nutrition bars list sugar as the first ingredient (typically as brown rice syrup – which is sugar! ), and have some kind of protein isolate rather than protein from a more natural source. While I’m not necessarily against protein isolates, they do signal that the product is likely pretty highly processed. Nutrition bars can be helpful snacks or meal replacements when you are on the go, but I prefer ones that are more “real food” based – for one they tend to taste better, and they usually use nuts and fruits for both their sweetness and protein sources. Top picks: KIND Fruit and Nut Bars, Lara UBER bars, Clif Mojo Bars. Most of these are fruit and nut based, but a few flavors contain protein isolates – be sure to check the label if that’s something you’re concerned about. Top picks: Justin’s Flavored Nut Butters (Honey Almond is my favorite! ), Jif Natural Peanut Butter, MaraNatha Nut Butters. The bottom line: Pick a sweetener based on the taste you prefer, not the supposed health benefits, and use it in moderation. No matter what you call it – coconut sugar, evaporated cane juice, brown rice syrup, agave, honey, maple syrup, or corn syrup – it’s all sugar, and it all contributes essentially empty calories to your diet. 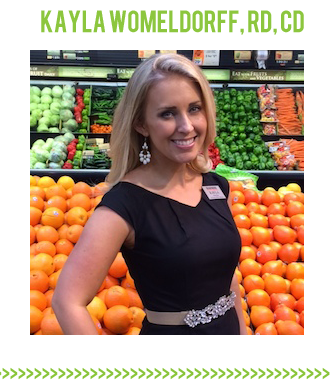 Kayla is a registered dietitian living in Salt Lake City, Utah. She received her Bachelor’s degree in Food and Nutrition from the University of Idaho, where she completed the Coordinated Program in Dietetics. In addition to her degree in Food and Nutrition, Kayla also holds a Bachelor of Science degree in Psychology. 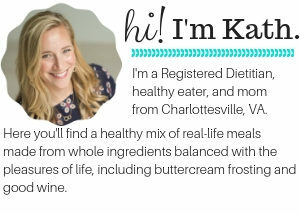 Kayla is a firm believer that healthy and delicious are not mutually exclusive, and she loves getting to teach people how to incorporate foods they love into a healthful, nourishing diet. When she’s not working at Harmons, Kayla can be found running, cooking, or shopping, and drinking far too much coffee with her medical student husband, Matt. Great post! I really, really wish all grocery stores modeled themselves after Harmon’s. Can you imagine how different things would be if fresh fruit and healthy foods were mass marketed instead of chips and soda? There is a local grocery store here in Richmond (Ellwood Thompson) that has a dietician on staff and I got to meet with her for a wellness challenge they did in the store. It was really cool and pretty awesome that a grocery store would offer that. I hope that becomes more common! I live in Salt Lake and just LOVE Harmon’s! It was great to read some of the new information about what they’re doing to be health-forward though! lots of great info I didn’t know. I am in LOVE with the idea of a checkout aisle that doesn’t have oh say, Butterfinger peanut butter cups to do the running man in front of me while we check out. I don’t buy them but who needs to temptation when you’re just trying to check out!? why didn’t you go into either one of the fields you were interested in? Private of store dietician? I’m sure you would have been so amazing and inspiring! My intention was to open a private practice, but between KERF and deciding to open a bakery, I was spread too thin to make it happen. It’s still in the cards though, perhaps when my kids are older, if/when KERF is over or another point in life. What a cool job! I honestly had no idea that one could be a grocery store dietitian, but it makes perfect sense! This was a fun post to read! I loved reading this – thanks for sharing! 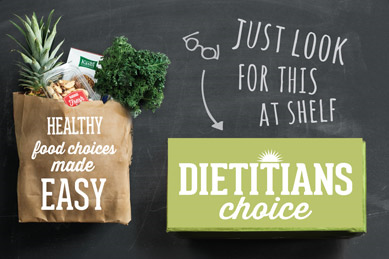 I wish more grocery stores had dietitians on hand as a resource for people. I think teaching people about food at the source of purchase has the potential to be really powerful and impactful. Great post! What a great idea to have the end caps at the check out aisle be all healthy foods – super smart! What are your thoughts on Stevia? She didn’t mention this in the sugar category and it seems a lot of health food products are gravitating towards this option. Great question, and one that we get asked a lot! My thoughts on stevia are pretty much the same as my thoughts on all non-caloric sweeteners (Splenda, Stevia, Sweet n’ Low, etc. ): in moderation, they can be part of a healthy diet, and can be an appropriate alternative to sugar (which most of us get too much of! ), especially for people with diabetes. However, they don’t contribute any energy or nutrients, and they can keep us dependent on the taste of sweetness. This post was especially interesting — my favorite of your guest posts. Kath, I’m curious if you saw this new study just released? I’d love to have your thoughts on it! That was a good read – thanks for sharing. I think that for every article that comes out like this there is one to “prove” the opposite, which is why it would take the entire medical community taking a stance on a large range of research before I’d be convinced that any diet other than eating real food, not more than you need, focusing on plants and pastured meats, getting good exercise and rest is best. I too am a long time reader, but I enjoy the sponsored/guest posts. I enjoy the variety of information Kath posts. Frankly, what I don’t enjoy are the whining comments from some of the readers disguised as being “helpful” about the posts Kath chooses to make. People change, they grow and that is what is reflected in her choices. If the post for that day doesn’t appeal to you, then move on. You aren’t required to read every post. People, please stop the whining! Again, this is MY opinion as a long time reader. Keep up the good work Kath! A lot of us enjoy what you do. Exactly! Kath has great posts and info! She also made a decision to not post as often as she did before her son was born, but she still posts often. Give her some slack – skip the posts you don’t want to read! 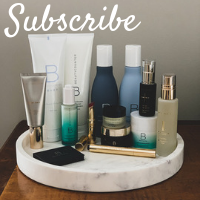 Personally, I am grateful to read her blog and it’s one of the best out there! Wonderful post–I had no idea that this was an actual job. Fascinating stuff–thanks! I love this post! I had no idea most grocery stores had dieticians. Such a cool job!! What a great post! It’s great to see what a real registered dietitian has to say about food! !1 I thought about taking the RD test after completing my undergraduate degree, but it was too time consuming to complete the actual career – especially with a little one on the way. Anyhoo, I had no idea that grocery stores had dietitians! You’ve single-handedly inspired me to renew my interest in becoming a real RD and go back to school! Wow – thanks, Jemima! I’m sure that Kath would agree that being an RD is such a rewarding career, and I would recommend it to anyone with a passion for food, science, and helping others. Good luck finishing school, and congratulations on your little one! This sounds like such a neat job! I’m glad you mentioned Nutella in this post. It’s surprising how many people consider it to be nutritionally equivalent to other nut butters. Does Kayla have a blog? I can’t even tell you how much I love that you featured Harmons on the blog. I live in the SLC area and down the street from Harmons. We try to always buy the dieticians choice items when we can. Such a great program! So happy you featured this! Great piece! This RD approves of all these tips – such important ones. 🙂 Also, this job sounds AMAZING. Why doesn’t this exist in Los Angeles?!?! This was really informative–thank you! I do have a question though regarding KIND bars. I absolutely LOVE these bars however they contain inulin which I suspect may be contributing to my stomach woes, although I can’t be certain. Do you have an opinion or any information regarding inulin/chicory root fiber and digestion? Great question, Laura! Because of its natural sweetness and fat mimicking texture, chicory root extract is in a LOT of products. Inulin/chicory root are generally well tolerated in doses of up to 10 grams per day in healthy adults. (You can check out one of the articles here: http://www.ncbi.nlm.nih.gov/pubmed/20497775) Most KIND bars have between 3-7 grams of fiber, with probably about 2-3 grams coming from nuts, since it’s generally the first ingredient. So in each bar you’re probably getting somehwere around 1-5 grams of chicory root fiber. But, if you’re having more than 1 bar per day, or also eating other sources of chicory root fiber, you might be over your threshold, which could lead to gas, bloating, and other GI symptoms, especially if you’re particularly sensitive. Chicory root fiber has been shown to be a pre-biotic fiber, and can be good for digestion, so when used in appropriate amounts, it’s not something that I feel needs to be avoided. Please feel free to send me an email if you’d like more information! Maybe try choosing the KIND bars with less fiber (the Apple Cinnamon and Pecan and Cranberry Almond flavors have 3g or less and are fabulous! ), or switching to bars without chicory root fiber, like LARA Uber bars, and see how you feel. Thank you for the detailed response! I have yet to pinpoint exactly what is troubling my stomach (I’m lactose intolerant and noticing I’m very sensitive to fiber) so I can’t be certain if it’s the fiber specifically from the chicory root or just too much fiber in general. Trying the lower fiber bars is actually a fantastic suggestion and I never even thought of that. LARA Uber bars are my favorite! Thank you so so much. That sounds like such a fun job! Yay a fellow Grocery Store dietitian! Seriously the best job ever! I found this post to be SO interesting! Love your guest RD series!